PennsylvAsia: Free! Take Your Marks (特別版 Free!-Take Your Marks-」) in Pittsburgh, March 14. Free! 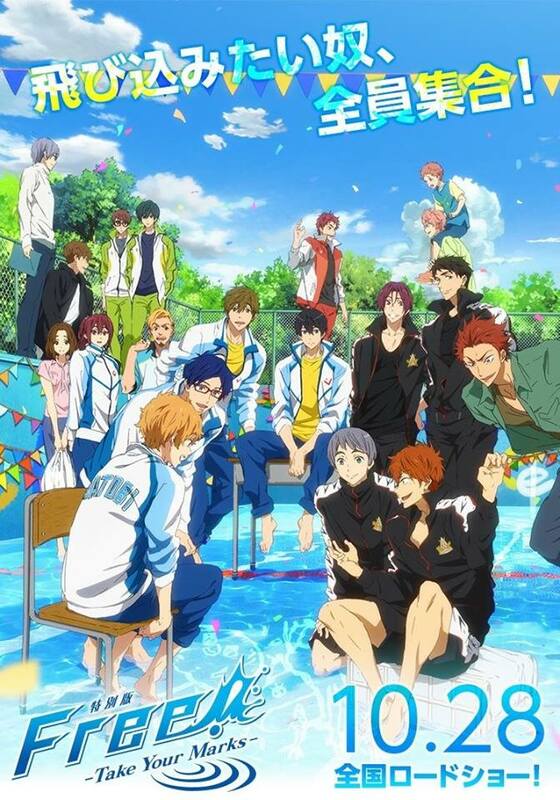 Take Your Marks (特別版 Free!-Take Your Marks-」) in Pittsburgh, March 14. Haru and Makoto are prepping to move to Tokyo, which means finding a new place to live! While they’re off searching, Nagisa, Rei, and Gou are left to come up with something big to enlist new Iwatobi club members. But can they fill the pool, or is the club’s future sinking fast? Meanwhile, the boys of Samezuka are having their own time getting ready for the future! While Rin prepares for his move to Australia and Sosuke moves out of the dorm, Nitori and Momo want to do something big to thank their senpais. A visit to the hot springs should do the trick, right? But a misunderstanding about Gou could leave Rin unsettled, and only a challenge in the water will set his mind at ease! The movie was briefly in Japanese theaters last October, the seventh highest-grossing movie in the country its opening weekend and #149 for the year. Tickets for the 7:30 pm show are now available online. Southside Works Cinema is located at 425 Cinema Drive in the Southside, one block from the Hot Metal Bridge (map). Holy Hum in Pittsburgh, May 3. Green Pepper to add Korean fried chicken to menu. Spring Festival Celebration at Pitt, February 16. Khruangbin plays Pittsburgh, April 6.